The great thing about the Odeon's Screen Unseen events is that you get to play a guessing game - they post clues online, and we the film fans get to guess which film is being previewed. Then they post the film's name online by accident and everyone gets pissed off. It's quite the laugh riot. This week, people were trying to guess Demolition. I've no idea what the clues were, but if people did guess it I'd be amazed because this film is all over the place you'd need an intimate knowledge of the cast to get anywhere close. Yet, amazingly, it's not a terrible film. Granted it was helped by there being a trailer for Everybody Wants Some beforehand (which looks set to give Boyhood a run for its money), but for a film with no coherent narrative and only one emotionally engaging character it's not that bad. 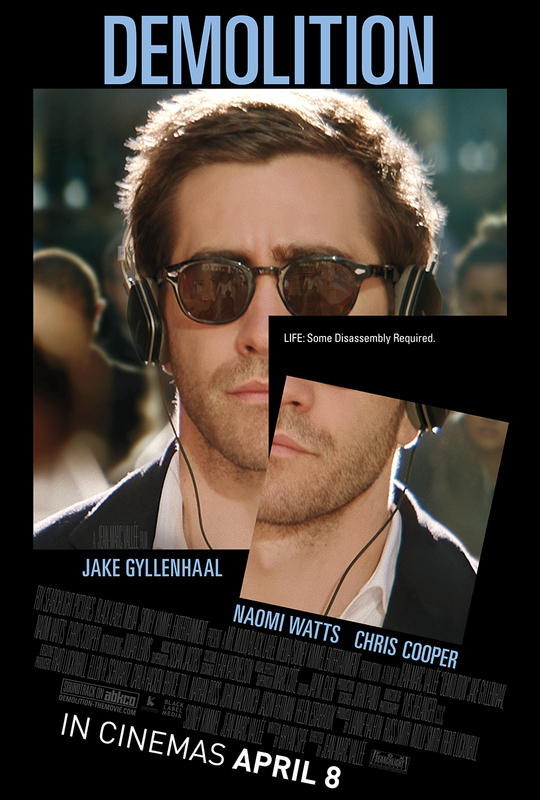 The plot, such as it is, centres on Jake Gyllenhaal as Davis - a man slowly unravelling after his wife dies in a car crash. On the night she dies a vending machine fails to vend some peanut M&Ms, leading Davis to write an overly-detailed letter to the company concerned. The letters lead Naomi Watts' Karen to break the ethical code of all customer servicers and make contact out of hours. From here, an unlikely relationship is formed. Well, it would, wouldn't it. If you can overlook the small matter of a man who didn't even notice his own fridge had been leaking for weeks suddenly pouring out his heart in minute detail to a total stranger, the opening half of the film takes a dark start and really tries to lift your spirits. There are chuckles, there are actual laughs, and while Gyllenhaal and Watts have all the chemistry of two dry sponges their individual performances are fine. Gyllenhaal has a knack for playing the emotionally barren, and here he's on fine form. You like Davis, and you even enjoy him taking things apart as he starts to examine what's happened in his life. His saviour, so to speak, comes in the shape of a young boy (the excellent Judah Lewis), who provides some sense of order and focus to Davis' life. Not much, granted, but some. And it's at this point that you realise Demolition is essentially a mash-up of every naval-gazing movie you've been forced to sit through. Unlikely man-woman thing going on? Tick. Young child who is unusually mature? Tick. Insights being gained and metaphors flying around like leaves in the wind? Tick. It's pretty much got the lot. But you can't hate it. 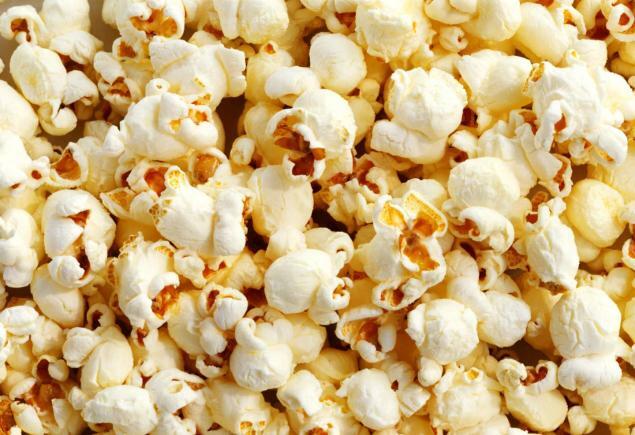 Not because it's good - it's not. And not because it has a strong message - because it really doesn't. But because it means well. Director Jean-Marc Vallee knows his way around a script (Dallas Buyers Club and Wild will tell you that much), and so can take the tortured threads of Bryan Sipe's script and give them heart and warmth. It's clear he cares about the story and the characters, which means that while you're trying to work out why any of this is happening you at least do so surrounded by warmth and comfort. As I may have mentioned, very little makes sense (Is it about depression? Is it about grief? Is it about finding your pack, your tribe, your group? Sure, why not) but for a good hour or so none of that really matters. Sadly, the last half hour or so let things down a bit. Things start to drag, points are laboured, things get rebuilt with amazing speed and ease and the final message is delivered with such blunt force (monkeys, that's all I'm saying) you'll likely suffer a concussion. 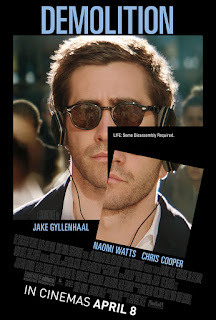 By rights you should hate this film, but thanks to its lighter touches, a delightful soundtrack and three strong - if disparate - performances, Demolition just about stands up. It's well made, looks great and is pretty inoffensive - yes, I grant you, when that's a selling point you're struggling, but it's true. Some, I'm sure, will come out raving about it. Others will wonder why they bothered. But at least you won't hate it. Probably.